The thin cornstarch bath is the secret to crispy, golden brown deep-fried sweet potato fries. The sweet potato strips are fried twice for a total of approximately 3 minutes, depending on the thickness of the potatoes. If you've had trouble getting sweet potato fries to crisp up, you should try this method. Season the fried sweet potato fries with Kosher salt or use a spicy seasoning, such as a Creole or Cajun blend. Or, for complementary sweet spiced flavor, sprinkle them lightly with cinnamon sugar. Serve the sweet potato fries with pulled pork sandwiches or burgers, or serve them alongside grilled ham and cheese sandwiches. Fill a large bowl with ice and water; set aside. Peel the sweet potatoes and cut them into 1/4-inch strips about 3 to 4 inches in length. Put the sweet potato strips in the ice water and let them stand for 30 minutes to 1 hour. In a large food storage bag or bowl, combine the cornstarch with 1/2 cup of cold water; stir until smooth. The mixture will be quite thin. Pour vegetable oil in a large, heavy pan or Dutch oven to a depth of about 2 inches. Heat the vegetable oil to 325 F.
Working in small batches, fry the sweet potatoes for about 1 to 1 1/2 minutes. Stir them a few times to keep them from sticking together. The fries should be tender, but not browned. Using a metal slotted spoon, lift them out onto paper towels or brown paper to drain. When all of the potatoes have been fried at the lower temperature, heat the oil to 350 F. Working in small batches, fry the sweet potato strips again for about 1 minute. When the fries are golden brown, remove them to paper towels or brown paper to drain. 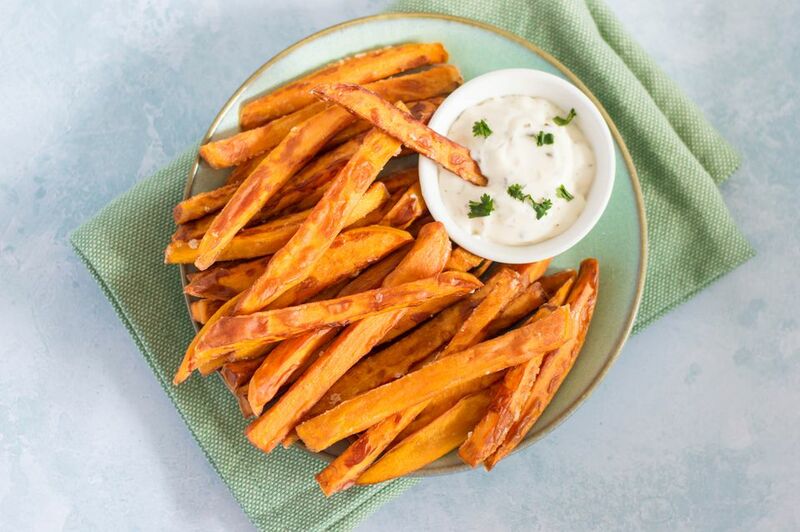 Sprinkle the sweet potato fries with Kosher salt or sprinkle them lightly with a cinnamon-sugar blend. Make sure you choose a high-heat neutral flavor oil for deep frying. Oil labeled "vegetable oil" is as good as any other, and it's probably cheaper. Sunflower, peanut, canola, and refined safflower oil are good choices as well. While olive oil has a high smoke point, the flavor would overwhelm the fries.